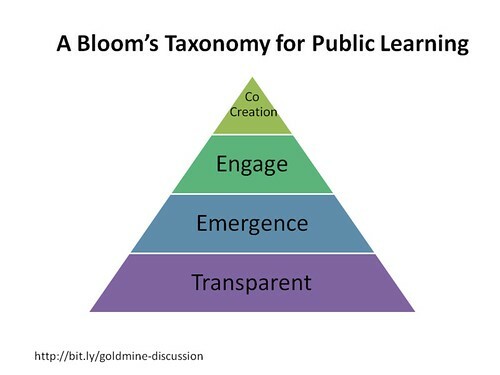 What is the scaffolding for learning in public? I’ve been writing about wikis (and other social technologies) can be terrific platforms for supporting professional learning in real time, but it requires a comfort level with “learning in public.” You can learn in public in different ways – self-directed individual learning, with a peer group or in an organization, or as a network or entire field practice. The Packard Foundation’s organizational effectiveness wiki has an excellent example of this networked approach to public learning unfolding. The Foundation has teamed up with an evaluation consultant, TCC Group, to figure out if working wikily can enhance the quality of learning as the OE Goldmine Research project and the Foundation’s OE program review move forward. The TCC Group is facilitating a “learn in public” process by sharing early research findings related to 1300 capacity building grants. There has been an interesting discussion on the wiki and blogs about strategy for public learning. What immediately came to mind was Bloom’s Taxonomy that classified different intellectual behavior related to how children learn. Learning goes from a lower level of entry to higher order thinking skills as follows: remembering, understanding, applying, analyzing, evaluating, and creating. But we’re also using social technologies which made think of the various “Ladders of Engagement” that communications strategist use to shape a campaign. Some are tool specific The Twitter Ladder or the Facebook Ladder or it may describes different levels of engagement across channels. Since networked learning happens in the context of an ecosystem, perhaps Gary Hayes Transmedia Storytelling model or Lini Srivastava’s Transmedia Activism model. Transparent: This is the first step to make learning products visible. For the Packard Foundation OE Program, the first step to share their internal thinking and resources with their NGO, capacity building, and funding partners. The early versions of the wiki were conceptualized as a “see thru filing cabinet.” Previously, much of the content available here was behind a firewall – for example internal tools like logic models and theory of change as well as various program and research reports in the subject matter covered by the organizational effectiveness program. The content doesn’t only include “finished” reports, but also works in progress like the the Goldmine Research project. Emergence: This is a term that I first heard from Eugene Eric Kim when talked about how making your ideas or content transparent on social networks like Twitter was similar to what ants do when they leave tracks so other ants can follow. Emergence in networked learning comes signaling to your networks – hey learning is taking place over here – come engage. Eugene Eric Kim offers a terrific description of this phase of the Packard OE Wiki in his post, “Why I Love Working Openly.” Eugene Eric Kim noticed a tweet from Stephanie McAuliffe — that allowed for this emergence of conversation on the wiki. Being able to easily share content and learning that is transparent, allows for emergence and getting to the next level. Engage: This is the process of having a conversation around the insights that are being shared. The Goldmine Project is sharing a, well, goldmine of knowledge around what makes for a successful nonprofit consultant and organization relationship. Look at this page of findings to begin to answer the question, “What makes an effective consultant/nonprofit engagement?” The top answer was “Understand grantee’s unique needs and culture and provide customized approach.” This data is rich for conversation that can lead to learning for both consultants and nonprofits. Co-Create: At this higher level, the conversations lead to co-creation. Maybe it takes the form of consultants using the findings to examine their own practice and improve it. Maybe it takes the form of collaboratively interupting the results of the evaluation. Maybe it leads to other collaborative creation. What do you think the scaffolds should be for learning in public as a field or network? What are the techniques and methods for moving people up the ladder?